The surge in low-speed serial buses in the consumer market has brought about the need for accurate protocol decoders. Traditionally, decoding a serial bus would mean a trip back to your introductory engineering class— lots of counting 1s and 0s. This method is tedious and prone to errors, so a better option is to use technology to decode serial buses. As oscilloscopes become the all-in-one lab instrument (some InfiniiVision scopes even include a function generator), separate protocol analyzers are no longer needed. I was able to explore this as an intern with Keysight this summer when I worked on the release for the I2S Protocol Triggering and Decode Software for Infiniium oscilloscopes. The three crucial signals in an I2S bus: data (yellow), word select (blue), and clock (red). The I2S bus is used to transfer data within audio systems. It’s a straightforward protocol consisting of a data line, word select signal and clock. From cars to laptops, the I2S bus is becoming pervasive in a range of industries, and this makes it an exciting protocol to work on as an intern. In August, Keysight released the I2S Protocol Triggering and Decode Software for Infiniium (Option N8811A). This Infiniium add-on features I2S serial bus hardware triggering*, I2S protocol decoding, and user-selectable signal alignment selections including support for time division multiplexed signals (TDM). The increasingly popular TDM I2S signals allow for multiple lines of data to be sent over the same bus. For example, this technology could be used in an automobile, where digital audio data can be sent to front speakers and a rear woofer through the same bus. Since TDM signals might include several channels in the same packet, these signals are particularly difficult to debug without advanced software. Using TDM technology, four unique channels of data are sent through a single I²S data line. In addition to TDM alignment, the I2S Protocol Triggering and Decode Software supports standard I2S, left-justified and right-justified signals. 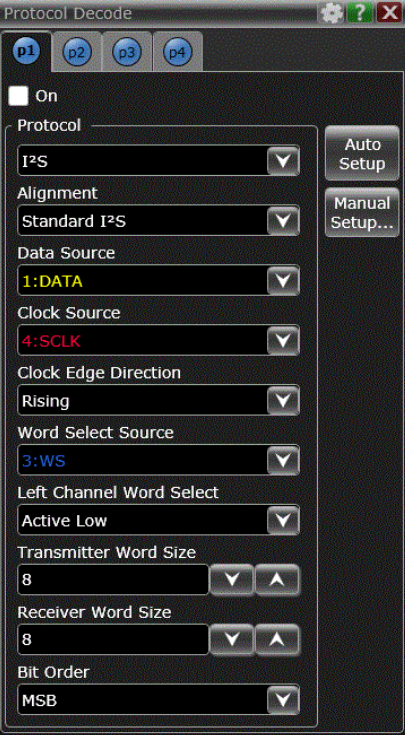 Any decode only requires three inputs: the data, word select, and clock line of an I2S bus. On a Keysight MSO, these can be either analog or digital inputs. 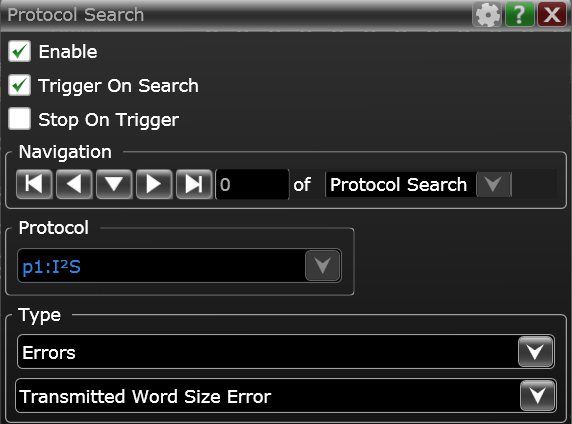 The protocol search tool makes finding errors effortless. Trigger on specific packets, conditions and errors. Throughout the industry, protocol decoding has never been simpler, more flexible or more reliable. With this new technology, you can be confident in your ability to decode any I2S signal – including TDM – and customize your decode to suit your specific application. Want to read your results in Hex? It’s just a tap on the screen. Want to use a digital clock signal but an analog data signal? It’s a touch of a button. Want to turn your instrument into an alarm clock? Well…you might want to check out this video first https://youtu.be/4sqmvzxFISE. In all seriousness, ultimately what I found most impressive about Keysight’s software throughout my internship experience was the ease of use. I came to the office with only two years of engineering school and I knew absolutely nothing about serial buses—I complained that a spec that used the term “slave mode” wasn’t PC. To be honest, the Infiniium oscilloscope software made my job really easy -- it’s not just accurate, it’s intuitive. Every scope has a built-in help menu and demos for protocol decode applications so I could figure everything out on my own. Keysight’s I2S Protocol Triggering and Decode Software for Infiniium oscilloscopes may be the best I2S protocol application. But it wasn’t programmed for a serial bus, it was programmed for people. That’s what sets Keysight apart, and that’s how you’re going to solve your signal integrity problems. The title to this is a bit misleading...Signal Integrity Issues are not usually solved by protocol triggering and decoding. Issues that can corrupt a serial bus (such as I2C) are typically more associated within transmission line, impedance mismatching crosstalk, clock jitter, etc. Eye Diagrams and BERT (Bit Error Rate Test) equipment are used to measure the integrity of the digital signal. If the signal is already corrupted, the decoding mechanism will fail to interpret the correct value. It looks like the application only does post-processing search-and-find SW triggering which isn't useful for infrequent events. Can you confirm?